Arsenal completed deals of 2017. Olivier Giroud, Laurent Koscielny and Francis Coquelin have penned long term deal at Arsenal, as per official website. 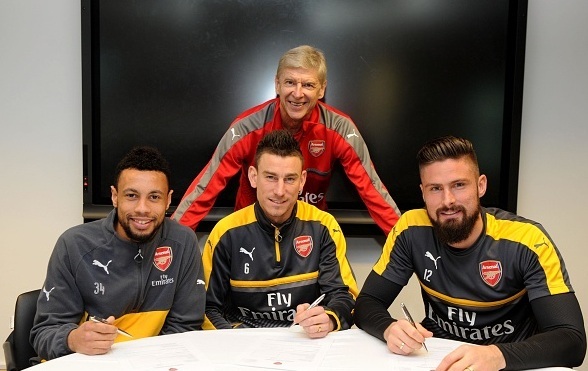 Olivier Giroud, Laurent Koscielny and Francis Coquelin have penned long term deal at Arsenal, as per official website. The trio has been consistent for the Gunners in the recent games, they all have signed a contract extension. Giroud has returned to the starting lineup with a wonder goal, a scorpion-kick against Crystal Palace. That goal could win the goal of the season award. Koscielny and Coquelin have already been a vital part of the Gunners in the recent seasons, they both have cemented the spot in the starting lineup. Coquelin has developed as one of the most important player for the North London side, while Koscielny who joined six year ago has taken the control of Arsenal’s defence. Arsene Wenger revealed that he is delighted with these new deals as all are very important for the team. The Gunners are on fifth spot eight points behind the league leaders Chelsea and a point behind the fourth spot side Manchester City. Arsenal will be travelling to Wales to play a game against Swansea City this weekend, these new players are all expected to start.